The best thing about solo vacations is, there's lots of time for sewing! On my recent trip to Idaho, I hid out in a mountain cabin and sewed for three days -- what a treat! I made two projects, start to finish. First up, a 25th anniversary quilt for my nephew and his sweet wife. Wedding and anniversary quilts are the only ones for which I allow requests. 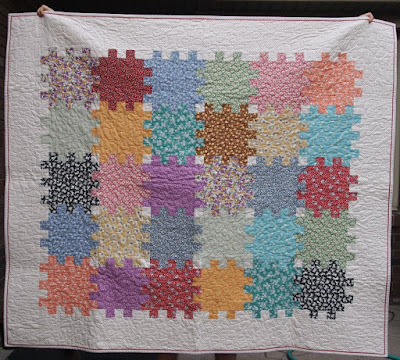 Kristi saw a "puzzle quilt" online and said, "That's what I want!" It took me a few months to find pattern, then a few more months to decide on fabric, then a few more months to get it sewn, quilted, and bound. But it will go in the mail today! The pattern is "Snuggle Blocks" by Margot Languedoc Designs for The Pattern Basket. I made it one row longer, so it's a good "snuggle" size. The fabric is 30s reproductions from my stash. Background is Moda's Essential Dots from Ruth's Stitchery. It's tiny red dots on an off-white background. The binding, of course, is Susie's Magic Binding with a solid red flange.The pattern quilt finishes at 49" x 58" -- this one is 10" longer. Next up is a hostess gift for another niece, who displays rooster motifs in her country kitchen. I bought this table runner kit in Schertz, Texas last summer at the Scrappy Quilter -- you know, because it's OK to buy it just because you think it's pretty! When I spent the night at this niece's house, I knew this runner would be perfect for her. It was pretty funny trying to get a photo -- thanks, DH, for being the quilt hanger! The fabric is Bohemian Roosters by Daphne B for Wilmington Prints. The runner finishes at 12" x 63" -- longer than most, but my niece has a big kitchen table. Today, I'm working on the 12th birthday quilt for the last great-nephew in that generation. It's a new technique for me, so come back Monday to see what's on the design wall! Yay for you - love the puzzle quilt I'mn sure they will be delighted.